Today’s gallery is full of chic highlighted hairstyles in a range of natural and rainbow colors. Fantasy hair colors are part of mainstream hairdressing now and have cast-off their punk, goth and hippie image to become the latest hair color trend for the well-dressed, well-groomed woman! Read on to discover how you can freshen-up your image with a new, highlighted hairstyle! This short, angled bob has plenty of natural volume from the model’s thick hair, which creates a lovely bouffant curve at the back. The asymmetrical styling has a side parting with a trendy long side-swept fringe. 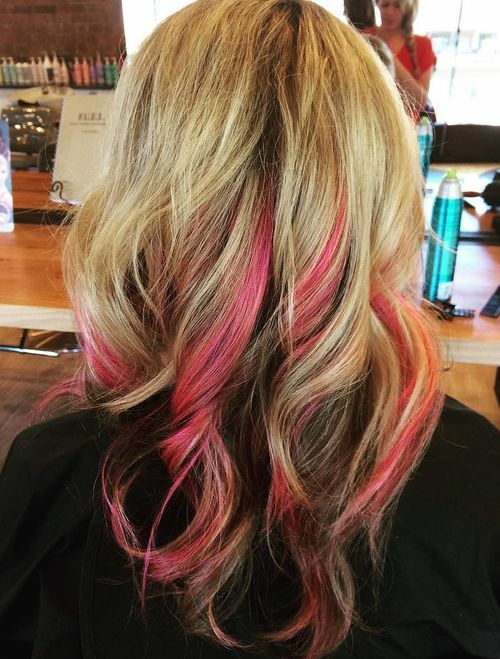 And to bring it completely up-to-date just add a touch of pink balayage! 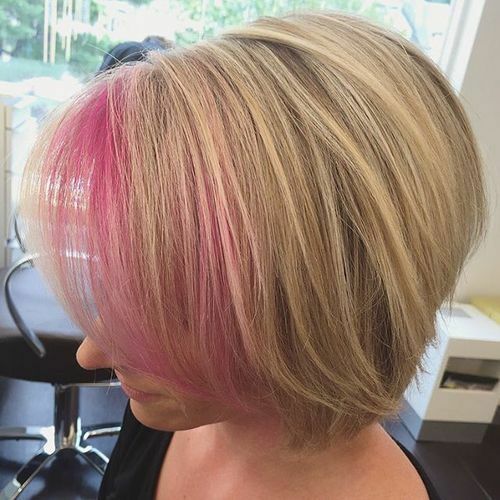 This popular short bob gains individuality and contemporary style from this triple hair color idea. 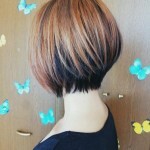 The stacked section above the nape is light ash-brown, and the top layers are a trendy neutral-blonde. 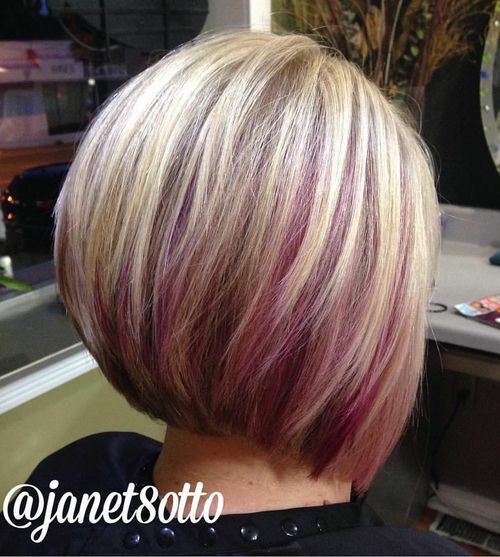 But in-between is a fabulously fashionable layer of raspberry-purple creating a fresh, new look! Fine, silky hair cut in a straight, modern bob always needs a little ‘something extra’ to distract attention from its flat texture. 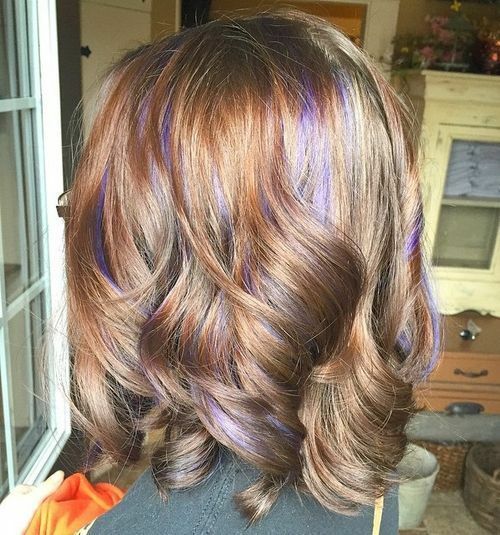 The lovely purple section is a fabulous way to give thin hair a new personality and youthful image! 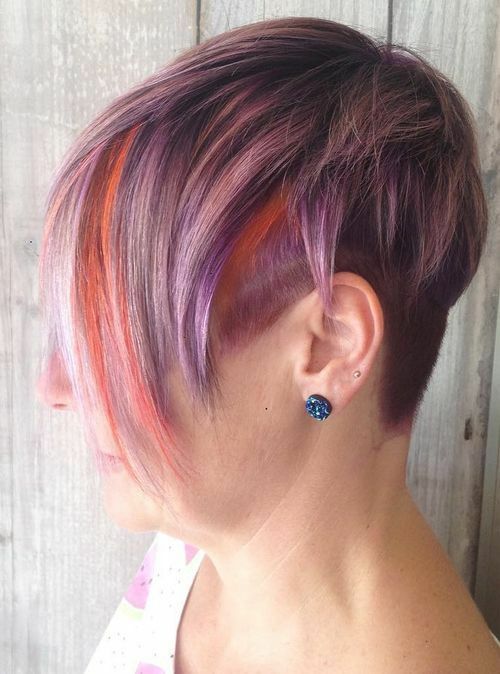 This edgy geometric cut has very short back and sides, over which long curved layers hang in colorful splendor! 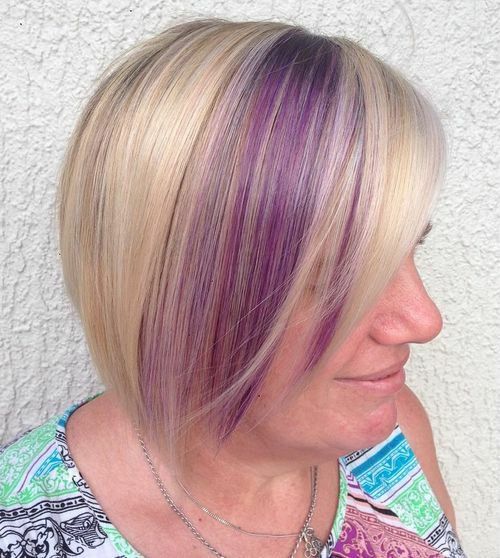 The ultra-modern colors include ash-lavender, white-blonde, orange and lilac, softening the lines of this high-fashion, chic haircut! 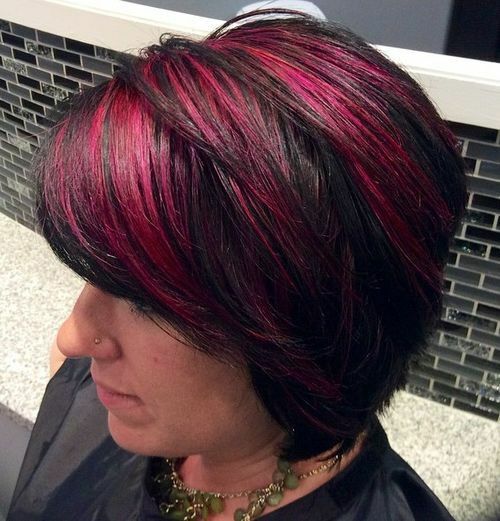 Adding a deep, pinky-red shade to straight, black hairstyles instantly makes you look trendy and youthful! This short hairstyle for thick hair looks livelier with broad bands of warm color accentuating the movement! 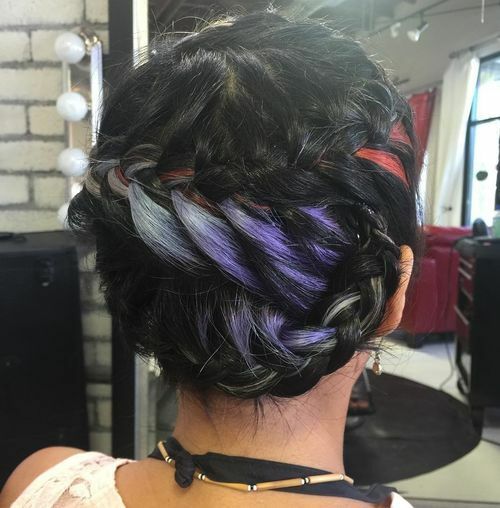 Here’s one of the latest and best Boho hairstyles for this season, with amazing use of color in a braid up-style! There are several different braid techniques here, and each one is highlighted in a different fashion shade including copper, crimson, lavender and white! Here’s a fabulous, contemporary twist on the long, blonde hair look. The hair is beige-blonde at the roots changing to white- and ash-blonde at the tips. And lovely lavender and pink ombré completes a super-trendy look for oval faces, with a center-parting and face-framing ‘wings’! 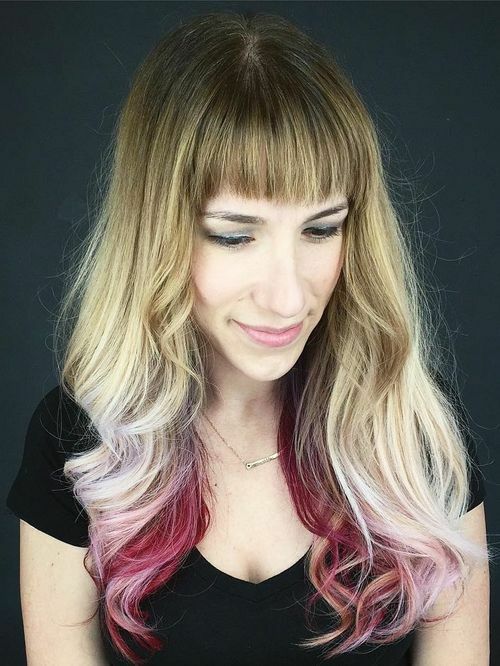 This is another Boho hair color design that’s an inspired mix of different, but complementary colors! The overall impression is of shiny, metallic shades including silver, copper and pewter-gray with pretty lavender balayage peeping through the wavy layers. Coffee-brown hair, without any natural gold or copper glints, can look rather plain in straight styles. 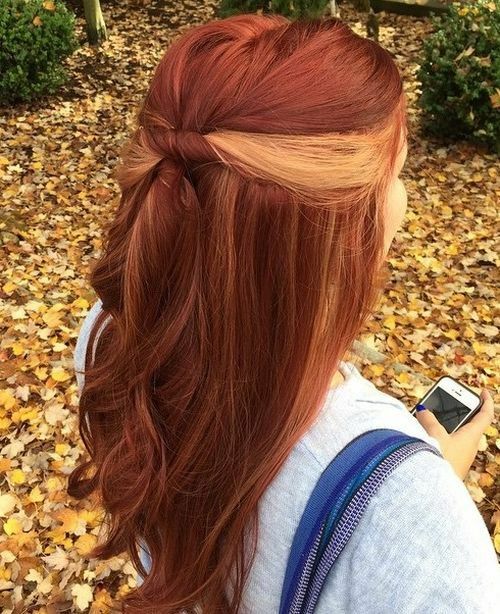 However, this fashionable new idea adds gorgeous warmth and texture with thick streaks of copper balayage. And adding tousled waves creates a younger, more casual image! This long, blonde style is transformed by super, strawberry balayage mixed in with cool ash-brown roots and low-lights on the tips. It’s time to update the advertising slogan, that claimed, ‘Blondes have more fun!’ I would venture to say that, ‘Women with rainbow highlights have more fun’! 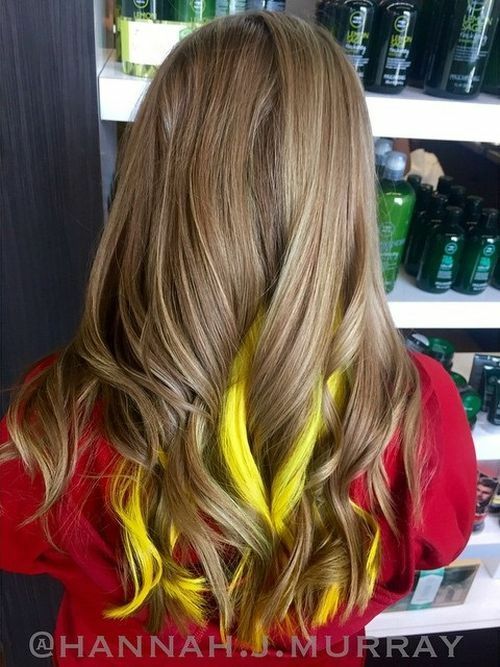 I’ve seen some amazing hairstyles with yellow highlights that create a super-stylish look – but this isn’t one of them. Yellow just doesn’t harmonize in any way with the lovely beige-blonde color on this classy look. So be sure to consult an experienced colorist who knows about complementary colors! Blue is a bright shade, which complements black beautifully. 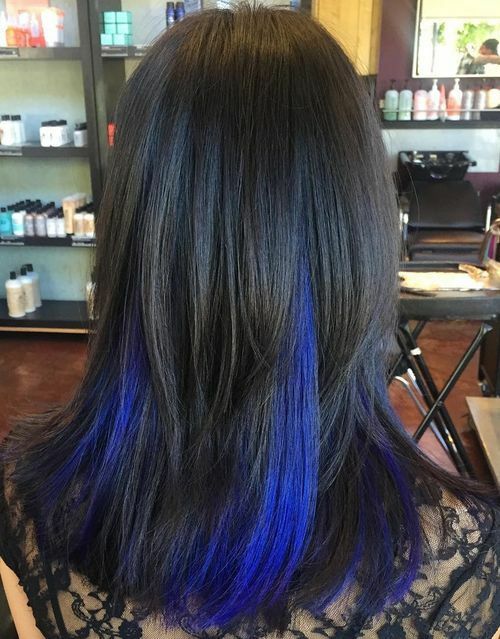 This simple haircut has long layers which reveal blue and purple balayage as they move around. 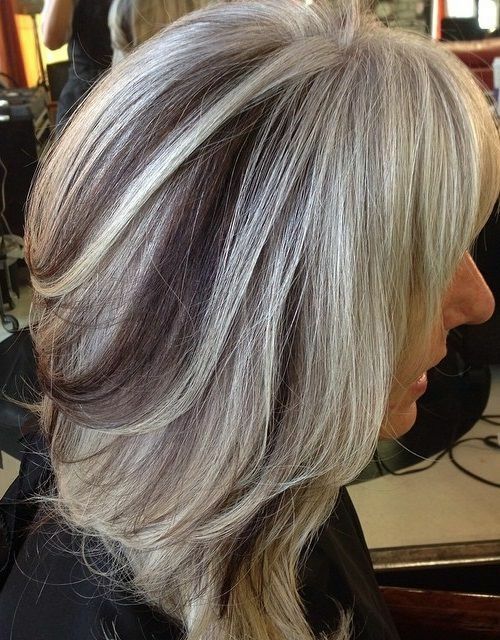 This new way to add ombré color on layers underneath the top section creates an fantastic, ever-changing color effect! This look is simple, straight forward and stunning, with a bold blonde section set in a fashionable asymmetrical position. I love how the blonde covers almost half of the bangs and that shorter layers of copper hair drape over the blonde tresses! Do you love this style? And you can find more amazing long hairstyles here. 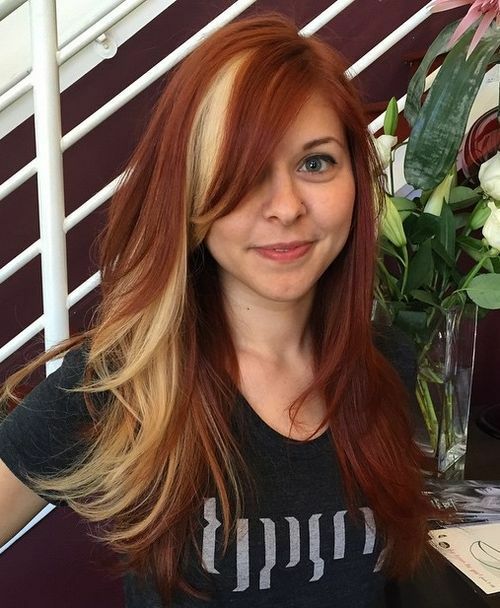 Here’s a completely different look, which is also created by adding blonde highlights to long, russet-red hair! Copper-blonde is added to the sides, next to the face, and it shows up beautifully on this romantic, half-up style with a medieval-style twist decorating the back. 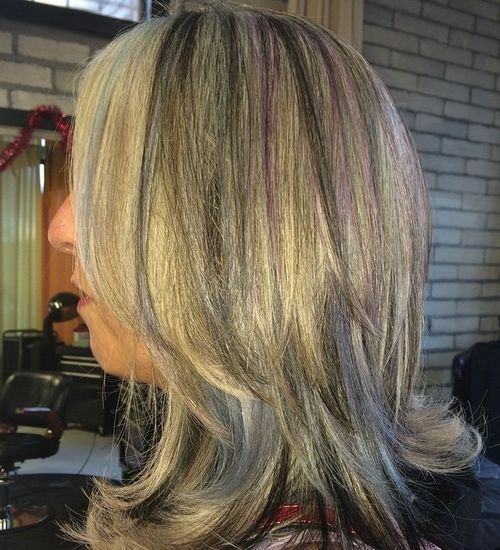 A lot of women with gray, silver or white hair are opting to retain their new, natural color and just add artistic/playful color accents! 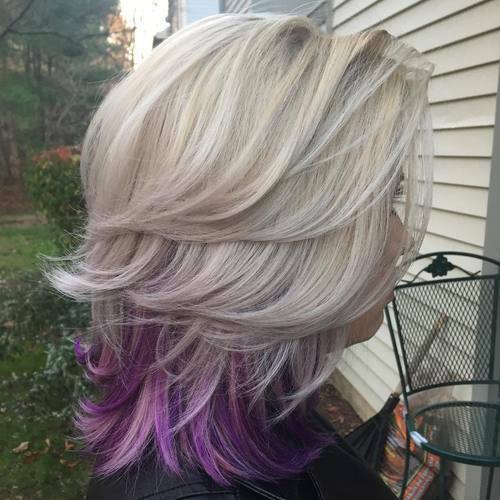 This model has kept her thick hair in a shoulder-length style with trendy colors like pastel-blue, silver, purple and black – showing you can still be stylish at any age. 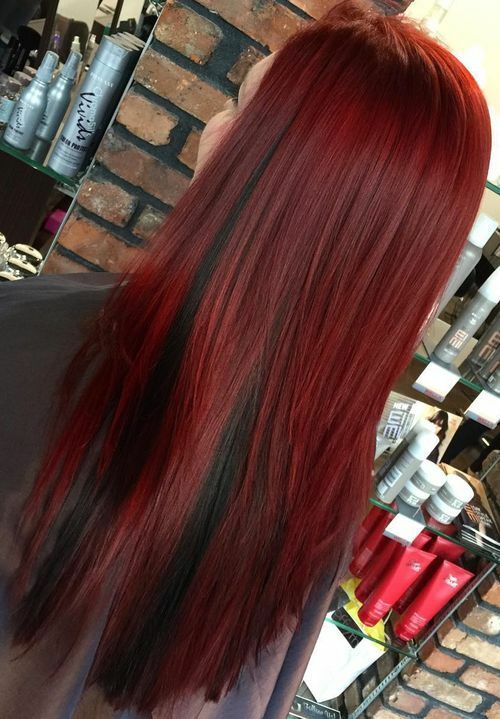 Here’s another example of a two-tone hair color with black on the underneath layers, peeping through the deep red top layer. 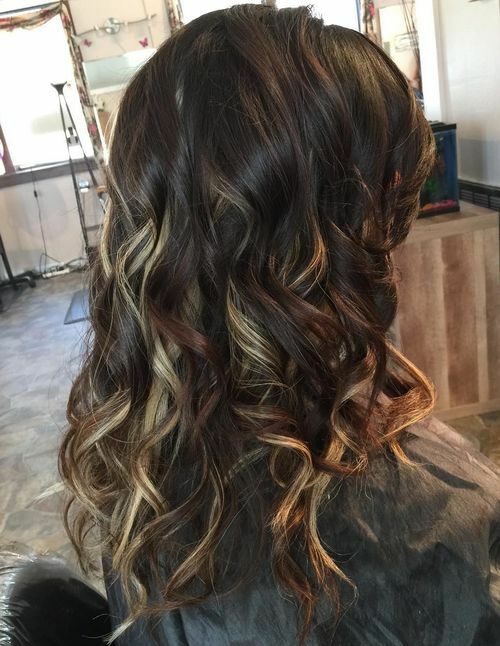 It creates more texture and color depth than just adding a graduated ombré, and the up-styles/braids have wonderful color patterns! If you must have long hair with your long/thin face, balance your face shape with long bangs that cut-off the forehead. And use side waves to add ‘width’ to a thin face/pointed chin. This length ‘elongates’ the face, but the sophisticated white, beige and dark-crimson hair colors draw attention to the décolletage! Add some exciting new style to your traditional blonde highlighted long hair this season! 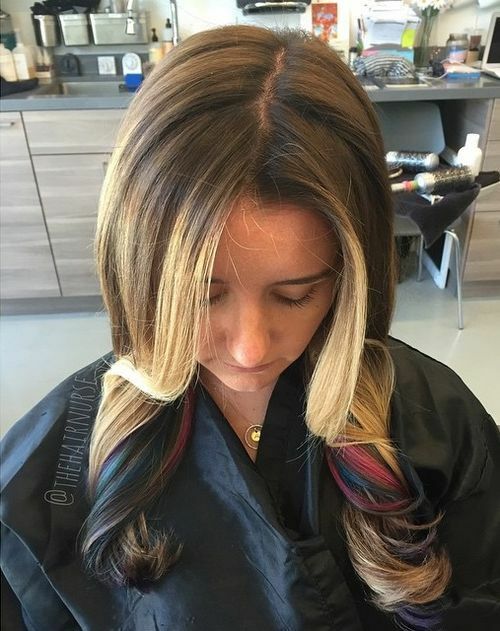 Turquoise, deep-pink and ash-brown shades look fantastic in loose twisted waves on this long hairstyle. Here’s another white-haired model whose thick hair still looks great in a long, angled bob! 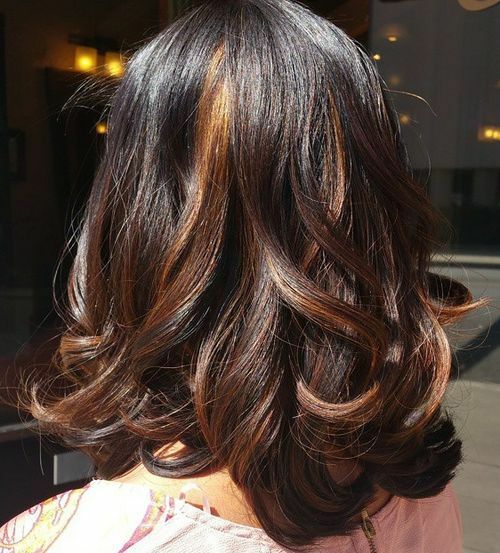 And deep-brown low-lights are a whimsical way to add attractive color for definition and texture, while accentuating the movement of long layers. And if you’re finding it hard to imagine yourself with lavender or pink balayage just now, this classic highlighting style of fine blonde streaks is back in fashion! 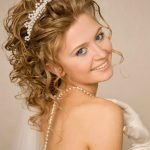 It’s a lovely way to add extra pizazz to your hair for a special event – accentuating movement and texture in a classic hair color idea. Will this be the season when you cross the line between natural and rainbow highlighting? Whatever you choose, remember fashion is a fun way to display your personality and style, and embracing new ideas is the mark of a confident, fashion-conscious woman!